I want to ask myself what I’ve been listening to lately. But there has been a drought. And the Internet seems to agree. I hadn’t made a mid-year year-end list only because I was busy moving twice and quite frankly, I’m not sure I care/I’m over the whole year end list thing. (Hell, in the last “What Have You Been Listening To Lately?” post, I mentioned Chance The Rapper AGAIN. Because Duh.) Reading year end lists (I mean, c’mon, I’m gonna read them) is enough of a project. That and, it’s been months since something remarkable has caught my eye. This started when, yesterday I got an out of the blue email from the Editor In Chief of a website. He found my blog via my review for Devon Powers’ “Writing The Record” and loved it. He asked me to join the writing staff for the site he edits. (Just another reminder that blogs are real.) Over the course of several emails, me answering a formal set of questions and a brief friendly g-chat, we still need to have an Internet face to face interview. But I think it looks good. Today, he asked me what my favorite records of 2013 would be so far – amongst other friendly music chats (like, calling me out for hating The Boss while being from NJ (yeah, no one is gonna win that one) and telling me why he hates Tame Impala when I asked him if he heard the new Pond record Hobo Rocket. Ironic that he didn’t know both bands shared band members. I just said they were “psych-y”.) He ended up having to split, so the conversation abruptly ended before I had the chance to answer. I told him I would sort out a list for our next chat. And I’m not sure how my small Year End List (SO FAR) paints me. It’s all boredom blues and aloof aquamarine. (Get it? They’re both blue.) There seems to be this swerve towards metal being popular (like the whole Deafheaven thing) which isn’t for my ears. Although the current of mainstream paying attention to metal ALL OF THE SUDDEN is fascinating. Then there’s the dance crave, which I don’t think needs an explanation. (Maybe James Blake and The Weeknd could explain it?) And there’s the “punk” thing like Diarrhea Planet, who are really not for me. But whatever. TECHNICALLY, their record was just announced. But we knew one was coming. One of my many family nicknames is the Credit Monger (I’m always requesting credit for doing, knowing, saying something first – let’s call it the youngest child syndrome) and I’d like to take FULL CREDIT for this next part. 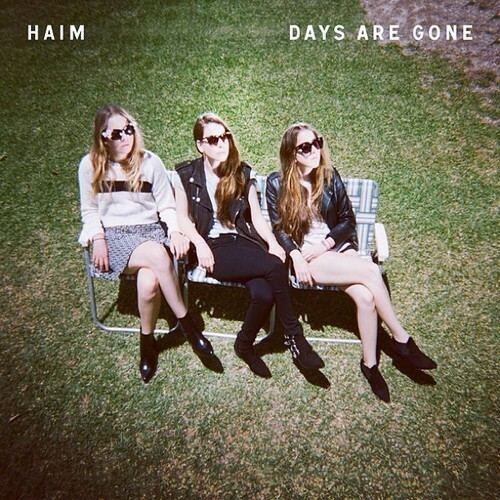 Haim will release their record (which is called Days Are Gone. OF COURSE it has the word “days” in it!!) on September 30th on Columbia (DAMN!). The Fork will give it a Best New Music tag – hell, I’ll do you one better and say Lindsay Zoladz will write it. (This isn’t a nag at Zoladz. She is a terrific writer. I’m just SAYING she’ll be writing it.) And it will be at the top of, pretty much, every major publication’s Year End List. Although, if I’m wrong, I’m buying you all ice cream. My distaste for the hype for this record came when I heard another song from it, “The Wire”, I recognized it as “Heartache Tonight” by the Eagles. The main riff sound EXACTLY like that track from The Eagles (which Noisey already pointed out, but you only need ears to notice this.) They actually sound like every rock band that has come out of southern California over the last few years (just like the hushed whisper thing Dum Dum Girls does and the depressed ray of sunshine that is Best Coast.) Actually, they kind of sound like every new band who are all doing the, let’s call it, the Pixies thing (you know, where a mixed gender band goes alternative and sounds scratchy and INDIE!). Hopefully their WHOLE record will be diverse, and challenge me. And you. Hopefully, Days Are Gone will excite me. HOPEFULLY. But something inside of me tells me this is a band that found a niche sound, perfected it, got buzz via the buzz machine we all feed too much, got signed to a big label (which is weird on any level, just the words “big label”), they’ll get famous because, again, of the buzz machine, they’ll tour for a year straight and there will be a conversation about them everywhere, people will lose interest because their music will lose its luster. They’ll write another record that will probably be decent (and maybe even better but I can’t with that thought right now) and another band will come along and this cycle will start all over again. Basically, Haim is the new Foxygen. But, like I said, if I’m wrong I’m buying you all ice cream. There are bands all over the place. We’re up to our ovaries in them, which is usually fun. But sometimes you’re reminded that all the records and all the sub-genres sound the same. As the rest of my year-so-far wrap up goes, stuff like The National is so incredibly boring that I just want to……. There is the TOTALLY unexciting and major letdown that was the Fitz and The Tantrums record. Then there’s the “Magna Carta Holy Grail” debacle. Which still makes me mad. This year end list, and it’s only August/it’s already August, is slim. It’s small and a lot of the stuff on it is balanced through the genres. No, I’m not going to tell you what’s on it yet (because what’s the fun in that?) and I also don’t want to be pre-predictable. Hey, maybe Haim will end up on it. I am hoping I’ll have some time to devote to a year end list, of any caliber. That I’ll have time away from the wrap up of the first semester of graduate school. Because even though it’s a short list, it’s a damn good one.